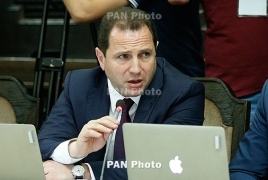 PanARMENIAN.Net - Some 100 Armenian soldiers will be sent to Syria within the framework of a humanitarian mission announced earlier, Defense Minister Davit Tonoyan told reporters on Wednesday, September 12. “These are the humanitarian experts of the Armenian Armed Forces, including doctors, sappers, as well as personnel who will ensure their safety,” Tonoyan was quoted as saying by Panorama.am. According to him, participation in the humanitarian mission in Syria is based on Armenian interests. While there are no deadlines, the legal basis for deployment and technical support is now being prepared, the minister added. In a conversation with PanARMENIAN.Net Arman Yeghoyan said the main objective of the mission is to provide humanitarian assistance to the Armenian community of Aleppo.